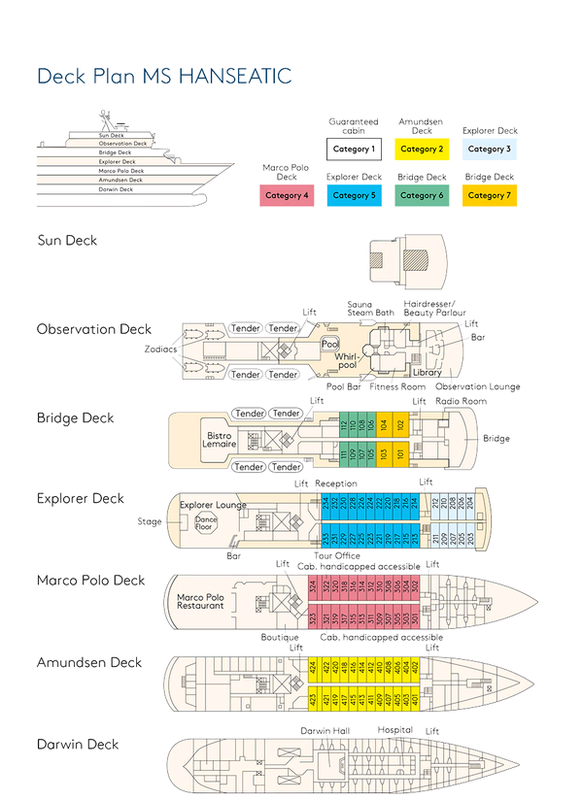 Aboard the M/S Hanseatic you will discover your very own personal expedition. Due to the background five-star service, you will enjoy your holiday to the maximum and it will become an unforgettable experience. The Hanseatic was built in 1991 in Finland. It weighs 8380 tons and has a draught of 4,90 meters only. It is a small and versatile ship used for expeditions but at the same time it offers more than average space for its 175 passengers. On its expedition-cruises extraordinary destinations such as Antarctica, Greenland, Micronesia or the North Western Passage are to be found on the itinerary. Apart from these, destinations as Norway, the Baltic Sea, the North Sea or the Mediterranean Sea are also attractive to the Hanseatic for their more individual smaller ports, off the tourist track. The itineraries are designed in a very individual and respectful manner. 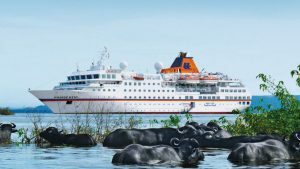 The Hanseatic is an attractive cruise ship for the explorer type of tourist. Moreover, it offers a five star standard to its guests. During the day the dress code on board is casually sporty and ashore mainly comfortable and appropriate to the destination visited. Only for the occasion of the Captain’s dinner a formal dress code would be recommended. Most of the guests belong to the middle to advanced age-groups. The Hanseatic is less attractive to families. During the day meals are offered within an open seating. In the evening dinner is served in the main restaurant. There is enough capacity in the main restaurant for all guests at once. The excellent culinary offer fulfills the standard of a five star service. Each cruise of the Hanseatic is accompanied by specialized lectors who will be happy to answer all your questions on the current itinerary. In exciting and interesting presentations you will gain all important background knowledge on the visited destinations in the Darwin Hall. Once reached the destination you will shipped out in individual Zodiacs with a small group only. This will offer you a chance to experience the wonders of our nature in the most possible individual way. There a sauna, a gym and a sun bed to be found aboard the Hanseatic. On deck there is a temperature-regulated pool which is filled with sea water. Moreover, there are bicycles onboard that you can use free of charge for individual excursions in the destinations. All cabins are comfortable and designed elegant. The average size of 22 square meter (suites 44 square meter) offers enough space for the guests. There are exclusively outside cabins. All cabins are equipped with a television with satellite program and a possibility to send and receive emails. Your mini bar will be topped up with non-alcoholic drinks free of charge on a daily basis.